Dried pears are probably our family’s favorite dried fruit. When we made them for my daughter’s preschool snacks, they were even a hit with the kids there. They are super sweet and keep that crunchy grit that great pears have. You don’t have to be too worried about how you cut them before dehydrating them, either. I’ve cut them thick and thin. I’ve cut them in rings and strips. No matter what, they’ve turned out delicious every time. Cut or core out center ( I used a corer and my mother-in-law used a knife). We do not peel them, and we do not place them in any preservative, not even ascorbic acid. You could to keep them from turning brown and to add some vitamin C, but if I have to add an extra step–I probably won’t get something done. So I skip it. I think brown is a fabulous fall color! Slice as desired into rings or strips. Most of ours were about 1/4 inch thick, but some were thicker and some thinner! ALL were good when dried. Lay on dehydrating racks, leaving space around each pear. Dehydrate at desired temperature. I did a batch at “live foods” temperature (105 degrees F/ 40.6 degrees C), and they were too moist for my taste. So I cranked the dehydrator up to 135 degrees F (57.2 degrees C). I dehydrate them until they are the dryness I desire, about 8-10 hours. We like them quite dry, and they keep longer this way. Even still, they are not “chips.” They are a little more chewy. I bought a large Excalibur dehydrator and have made myself use it. We like it a lot. We make dried bananas. I have the kids do it when we have a bunch of bananas going South. We make beef jerky. We make dried pears. Fruit leathers. Oh, and it’s absolutely awesome for yogurt. Just the best. So for us, the Excalibur was worth the investment. Anyone else dried any fruit? Like it? Any thoughts on dried fruit in general? Pears? Give us your tips, your pearls, your ugly thoughts! 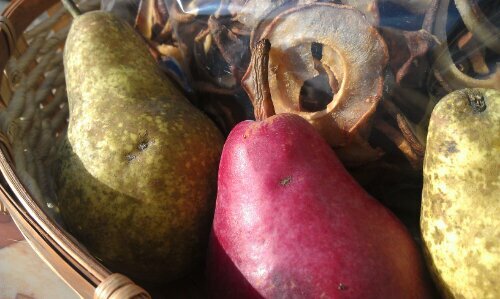 This entry was posted in GAPS, Recipes, Snacks/Preschool Snacks and tagged drying pears, Excalibur dehydrator, GAPS, how to, paleo, primal, SCD on September 11, 2013 by thehomeschoolingdoctor.